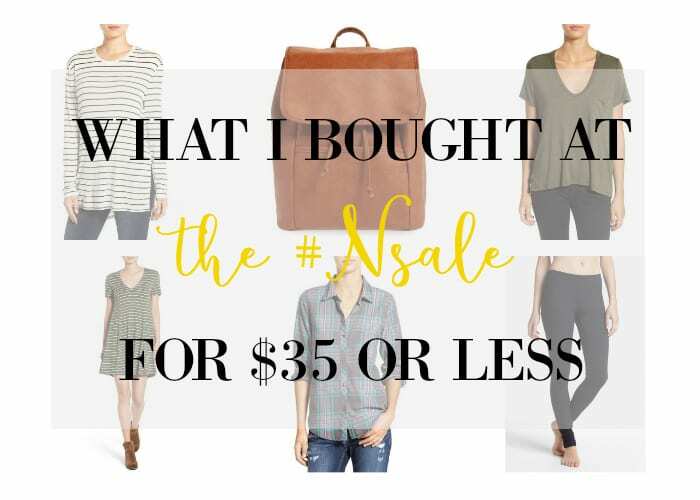 I finally picked up some items from the #NSale this morning–and they were all $35 OR LESS!!! In case you haven’t heard about what the #nsale is, it’s the Nordstrom Anniversary Sale that’s going on now. Nordstrom puts some of the new fall collections on sale for crazy discount prices–and yes, it’s new stuff! Usually you only see these prices after-season. That means you can go ahead and stock your fall wardrobe! First up, basics: I’ve heard wonders about the Zella Live In Leggings, and leggings are a cold-weather staple for me, so I had to buy them. I picked up the short-sleeved Lush tee since it will not only work now, but can be layered for fall. I purchased it in white, but there’s five other color options. And of course I had to buy the striped long-sleeve tee! It’s the perfect for a put-together yet casual look. For fun items, I finally jumped on the backpack purse trend. To be clear, I was on the backpack purse trend when I was little, but it’s been a good twenty years since I rocked one. I actually bought this Sole Society backpack (instead of the BP one shown below) in the Brown Saddle color, and it was only $29.90! Plaid is back for fall, of course, and I really liked the fun colors of this O’Neill plaid. Finally, I grabbed this Lush dress. It will make a great transition piece to cooler weather, and I can see wearing it with a long cardigan, tights, and booties this fall! If you’re looking to add some nicer things to your closet accessory-wise, may I suggest this Kate Spade watch (org. $225, sale $149.40), this Tory Burch wallet (org. $195, sale $129), or this Rebecca Minkoff bag in the blue shade (org. $195, sale $129.90). Don’t forget to shop with Ebates for 6% cashback on your Nordstrom order. Just go to the Ebates site, search for Nordstrom, click through, and you’re ready to earn cashback–get all the details on the Ebates website. Just remember that when Ebates opens a window for you to shop in, you have to order from that window/session for your cashback to count. The sale is currently open to Nordstrom cardholders, but you can apply online or in-store and shop right then if approved! Happy shopping!